Suffrage Wagon Cafe sponsors new program! on Vimeo. MORE PUBLIC SUPPORT FOR OBAMA TO AWARD CITIZENS MEDAL TO INEZ MILHOLLAND! Inez Milholland led inaugural women’s march in Washington, DC in 1913! As President Obama prepares to leave office in 2017, women from across the United States are preparing to participate in the women’s march in Washington, DC to tie in with the January 2017 inauguration of Donald Trump as U.S President. This will be the second historic women’s march in the U.S. Capitol linked to a presidential inauguration. The first was a woman suffrage demonstration on March 3, 1913 just before the inauguration of President Woodrow Wilson. 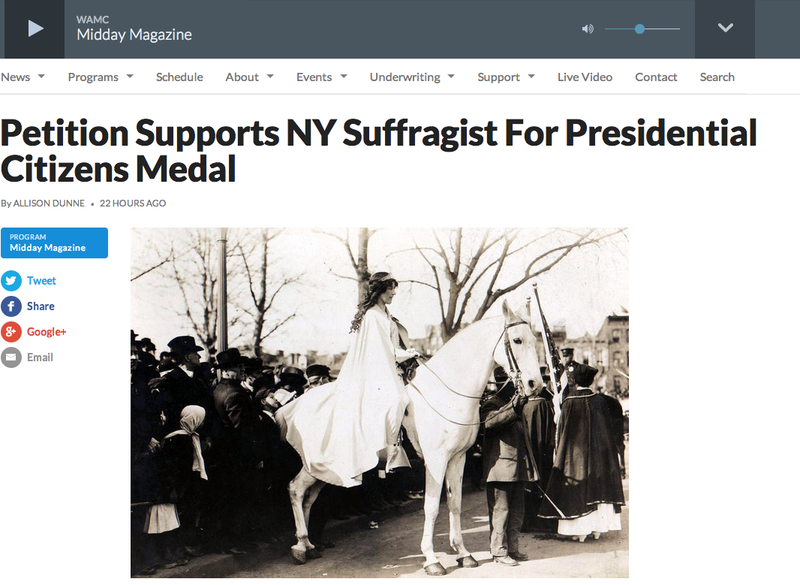 The leader of that 1913 votes for women march, which included between 8,000 to 10,000 participants, was Inez Milholland (1886-1916) riding a white horse. Her image was featured in newspapers across the nation. Three years later, Milholland entered U.S. history as the nation’s suffrage martyr. Turning Point Suffragist Memorial Association in Lorton, Virginia, has joined with the National Women’s History Project in Santa Rosa, California, as well as other groups and individuals across the nation as part of a growing network building toward 2020, the centennial observance of American women winning the right to vote. The present, past and future come full circle as these organizations join hands during the final days of the Obama administration. They are expressing support for the President to award suffragist Inez Milholland (1886-1916) with a Presidential Citizens Medal before he leaves office. Milholland, a New York attorney and suffrage leader, died in Los Angeles on November 25, 1916 of exhaustion and pernicious anemia. Born in Brooklyn, she graduated from Vassar College and New York University School of Law. She collapsed during a grueling speaking tour for the 19th Amendment and became a martyr to the cause of justice and equality. Details about this beloved suffragist, who died at age 30, are available at InezMilhollandCentennial.com. “We have a unique opportunity to give girls and women hope for the future,” said Pat Wirth, executive director of the Turning Point Suffragist Memorial Association that has been fundraising to build a votes for women memorial in Lorton, just outside of Washington, DC. The proposed memorial is scheduled for completion by 2020. 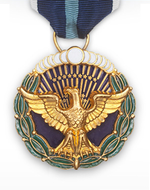 “The Presidential Citizens Medal is symbolic and it will offer tangible recognition of the long and difficult struggle of American women and their male allies to tip the balance toward equal voting rights,” noted Molly Murphy MacGregor, executive director and co-founder of the National Women’s History Project. The NWHP sponsored the yearlong Inez Milholland Centennial campaign whose co-chairs Marguerite Kearns and Robert P.J. Cooney, Jr. have prepared a petition and final support documents for presentation to the White House. One hundred years ago, while on the campaign trail in the west, Inez Milholland predicted that “Victory is in sight.” A century later, “Americans are still coming to terms with how the dream of equality has not yet been realized,” said Los Angeles filmmaker Martha Wheelock. In 2016 she produced and distributed “Forward into Light,” a documentary about Inez and has distributed it free to thousands of individuals and organizations across the nation. The DVD is available through InezMilholland.org. This coverage on public radio by Allison Dunne brings the story of Inez together in a way that sheds light on the nomination’s significance. Link to the story on WAMC radio.